This 2-Speed Rapid Lift XT Lift Table is a hydraulic scissor lift table cart with foot pedal operation. 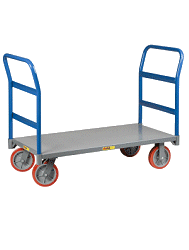 It's perfect in the factory, warehouse, office or shop, making lifting, positioning and transporting functions easier. Ergonomic styling makes the table safe and comfortable to use. 14 1/4in. to 50 3/4in.H lift range.